Japanese Episode AG 176: "Haruka vs. Musashi! The Final Contest!!" American Episode 446: "Going For Choke!" The second round of the Kajinoki Pokemon Contest is underway! As Musashi and Haruka push through to the final round, Satoshi and his friends are trapped by Kojirou and Nyasu. As Satoshi and his friends try to figure out a way to escape the prison they've been placed in, Shuu and his Flygon arrives on the scene to rescue them! Later, Satoshi and the others catch up to Kojirou and Nyasu, who have rejoined with Harley to sabotage the final battle between Musashi and Haruka. 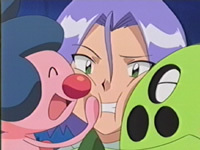 However, since Satoshi, Shuu, and the others arrive on the scene, Harley loses interest in fixing the Contest and decides to rely on the strength of his pokemon instead. The battle between Harley's Jupetta (under Musashi's command) and Haruka's Zenigame begins with neither side really dominating the battle. Jupetta continues to fire attack after attack, but Haruka's turtle pokemon is able to dodge a lot of them and fire back with some counterattacks of its own. The five-minute time limit runs out, and both sides have the same score! Marion announces that the battle will turn into a sudden death match with no time limit, telling each Coordinator to battle with all their might. After a few blows back and forth, Musashi loses all her points, resulting in a victory for Haruka! After Haruka receives the Kajinoki ribbon, she learns that the Kanto Grand Festival will be held at the Sekiei Plateau in one month. Determined to face off against Shuu and to get back at Harley for his trickery, Haruka gets pumped up for the upcoming competition. Bla bla bla unfair Zenigame bla bla bla Haruka's victories are a load of bull bla bla bla. I'm tired of complaining about Haruka and her Battle Frontier Contest arc, and I'm sure you guys are tired of reading my complaints. So, let's focus on other parts of the episode! I guess my big non-Contest related comment would be a question about the part where Satoshi and his friends escape from the pitfall that Kojirou and Nyasu dug. After they escape, they meet Harley, Kojirou, and Nyasu under the stage and banter back and forth for a bit. My question is...how did Satoshi-tachi even know that they were there in the first place? Are they just good at guessing? And for that matter....how did they get access to underneath the stage in the first place? Most productions I've been to that have involved a stage don't allow people to walk around freely under the stage (or, in the case of the last episode, the stage rafters). So how did they get back there? Is the security at the Pokemon Contests really that lax? The dubbed version keeps six pieces of Japanese music. That's double the amount they kept in the last episode. And you know how, in the previous episode, PUSA played the Pokemon Contest theme, a song that's never been played in the dub before even though it's been used in the Japanese version for years? Well, this episode gives us another one - this time, it's the music played when Banette's using Frustration. It's a piece that's been used several times in the Japanese version (most notably in the Burshamo vs. Lizardon fight in the Jouto League) but has never been heard in the dub. Yet here it is! Even though PUSA isn't that much better than 4Kids when it comes to replacing music, they at least surprise us every now and then by using a rare piece that we don't hear all that often. Yorunozuku and Foretos keep their Japanese voices. Throughout this episode, Musashi, Kojirou, and Nyasu all refer to Harley as simply "sensei" since they see him as being their mentor. The dub could have very easily translated this as "teacher," but they apparently decided against it and just had everyone call the character by his name instead. Meowth: "Y'know, Harley sure knows his stuff! You make a trap, then you back it up with another trap." James: "Perhaps we should approach that green genius about joining Team Rocket's ranks. [changes pose] Think of it. Our own special ops anti-blast off officer." Meowth: "Yeah! Sounds real modern!" As I mentioned above, Nyasu and the others simply refer to Harley as "sensei," so he doesn't say the mentor's name in his dialogue. The slip-up originally occurs during Kojirou's line. After the part where he changes his pose, Kojirou does an imitation of Harley and uses the Coordinator's name (since Harley, in the Japanese version, often refers to himself in the third person). After that, Satoshi are able to figure out that Harley and the Rocket-Dan are working together. Kojirou doing an impersonation of Harley is quite a funny thing to see, and I have no idea why PUSA would miss up on some easy comedy by rewriting the scene the way they did. Three seconds are added to that TO BE CONTINUED... screen that we all love so much.